In abruptly firing Jack Del Rio, Raiders owner Mark Davis continues to make the kind of angry, reckless bets that have made Vegas casinos rich — and one day might cost him the team. Oakland Raiders owner Mark Davis is being praised in some circles for “acting decisively” in firing head coach Jack Del Rio moments after Sunday’s loss to the Chargers ended a disappointing 6-10 season. Let’s call it for what it is: an act of desperation from an overleveraged owner with an astonishing lack of business acumen and a major case of buyer’s remorse. If Davis moves his $2.4 billion franchise to Las Vegas under the current financial terms, he just might lose the team one day if he’s unable to pay off the huge debt he’s taking on. And judging by the moves Davis made last weekend, nobody is more aware of this alarming possibility than him. The NFL’s army of blowhard pundits have already begun talking up Jon Gruden’s football expertise as the Raiders’ possible new head coach. But they’re missing the larger point. Davis’ abrupt and classless pink slip — delivered to Del Rio before he’d even held his postgame press conference — was made in the board room, not the film room. It was all about money, not football. 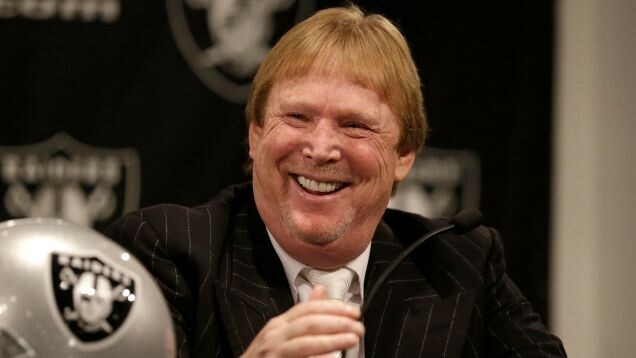 Specifically, it was about Davis’ increasingly desperate need to have a winning team the next two seasons, to help the Raiders market pricey personal seat licenses (PSLs) to Vegas residents and other Sun Belt fans, who aren’t best known for their deep pockets. It’s no sin, of course, to have a middle-class income. Guilty as charged. But you can bet Vegas’ lack of overall wealth is a serious cause of concern for Davis and the Raiders, who’ve taken on nearly $980 million in debt for the Vegas move. Davis owes $600 million for a Bank of America loan tied to the $1.9 billion Vegas stadium tab. He also owes the NFL $378 million over 10 years for the league’s relocation fee. Annual payments to offset the Raiders’ combined debt could quickly chew up yearly income and create red ink for a team that made $41 million in profit in 2016, according to Forbes magazine. And that debt is further burdened by the $77 million Davis spent for Vegas’ stadium site on Russell Road, and another $6 million he intends to pay for a proposed practice facility in nearby Henderson, Nev.
At this point, you might be asking a few questions, such as: Why would Davis go nearly $1 billion in debt for Las Vegas, a small market with a modest median income, few major corporations, and little sustained history of supporting big-league pro sports? And why would Davis take such financial risk when he could spend a fraction of that money in the lucrative Bay Area, where strong fan and corporate support would ensure big profits from selling out a new Oakland stadium and suites? And if this new debt level is necessary, even after Nevada legislators handed over a record $750 million in public money, is this deal really worth pursuing? Good answers to those questions have proved elusive nearly 10 months after the NFL approved his Vegas plans, which could be fueling Davis’ newfound anxiety on the football side. Before the Del Rio termination, Davis had been unusually patient by NFL standards. He has stuck with General Manager Reggie McKenzie, even though the Raiders have had five losing seasons in McKenzie’s six-year tenure, with an underwhelming 36-60 record. Sunday’s firing was especially eyebrow-raising, as Del Rio had an overall winning record in three seasons (25-23), and last year led the Raiders to their lone winning campaign and playoff appearance since 2002. That’s right — the Raiders have had eight head coaches in the past 15 years. Among that sorry group from 2003-17, only Del Rio achieved success. Del Rio’s “reward” was his sloppily executed firing, after receiving just slightly more time at the helm than Dennis Allen, whose 8-28 record is one of the worst in Raiders head coaching history. It bears noting that both Davis and McKenzie have failed to face the media to explain Del Rio’s exit. So, why the quick hook this time from Davis? It’s likely tied to the big bills awaiting the Raiders in Sin City. The Raiders plan to pay for part of the 65,000-seat stadium by raising $250 million from PSL sales. The average one-time cost for a PSL will be nearly $4,000 per seat, according to the Las Vegas Sun. That’s in addition to the cash a fan must shell out each year for a single Raiders game ticket, which ran as high as $1,725 per season in 2016. How many people do you know who can afford such prices? The Southland media blitz coincided with a battle against the rechristened L.A. Chargers on New Year’s Eve. It was the Raiders’ first game in Los Angeles since December 1994, just before they deserted Tinsel Town for Oakland. The ad campaign shows the Raiders believe they need old L.A. Raiders fans, along with Nevada residents, to buy Vegas PSLs to reach their $250 million sales goal. This is a foolish strategy, bordering on the insane — as can be told by anyone who remembers the poor, inconsistent SoCal attendance that plagued the Raiders from 1982-1994. Those spotty box office numbers at the L.A. Coliseum, coupled with fan misbehavior that scared away the corporate dollar, explain why Al Davis tried moving the Raiders back to Oakland as early as 1990, before officially doing so five years later. Put simply, if Los Angeles fans didn’t adequately support the Raiders in their own back yard, why does Davis think they’ll travel nearly 300 miles to support them now in Vegas? As for the Gruden rumors, reports say we’ll find out about their veracity by next week. If true, we’ll have plenty of time to dissect what it means for the Raiders in Oakland and in Sin City. That is, if Gruden were to last that long. Las Vegas has a storied history of emptying the pockets of people whose lone sin was letting a little greed get the best of them. Davis’ newfound impatience with the Raiders’ failures indicates a desperate desire to avoid joining that infamous list. Davis fired Del Rio just 10 months after giving him a four-season contract extension. In other words, Davis will pay Del Rio millions not to coach, even as Davis complains the aging Oakland Coliseum hurts his chances to make enough money to be competitive. Nevada casinos make millions from customers like Davis; people whose overly optimistic desert dreams are dashed by impetuous decisions and reckless money management. Those are problems that even the specter of Jon Gruden can’t solve. And if Davis continues this pattern of hapless decision-making, enduring the frustration of another Raiders losing season on his watch soon will be the least of his problems. The Deserving Dozen Et tu, Chucky?